Bronzeworker. Weaponsmaster of the Gods. The Lame One. The Ugly God. He is Hephaestus, the Divine Craftsman. Patient, stout-hearted, and clever, he is the Master of all Metals, the Holy Engineer. Celebrated for his wondrous creations, he is also pitied and teased for his lameness, his unsightly appearance, his estrangement from his family, and his marriage to lovely Aphrodite. But Hephaestus is not a God to be underestimated or ill-used — a reality understood by his modern devotees. In the pages of this anthology you will find poems, prayers, essays, artwork, and rituals glorifying the Divine Mechanic. Some of his devotees see his hand in the engineering marvels of the Industrial Age and the hardware of the Information Age. Others see his handiwork in the heavens or hear his rumblings deep in the earth. Still others see lessons to be learned in his reconciliation with his mother, Hera, and his very nature as a “disabled” God. Harnessing Fire may be purchased in paperback format through Amazon in paperback and for the Kindle; and through Barnes and Noble. 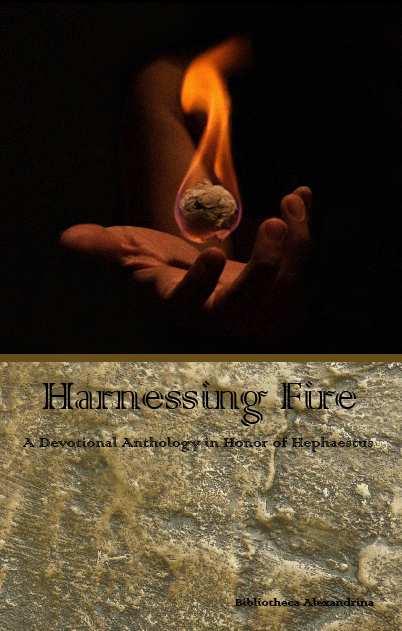 All of the proceeds from Harnessing Fire – as well as many of the other volumes in the Bibliotheca Alexandrina series – will be used to help promote the revival of the worship of the ancient Gods, with a portion of the proceeds given to a worthy charitable organization in their name. So, not only will you be getting a wonderful book about the modern worship of Hephaestus – but your money will be going to do good work and help the revival of ancient polytheistic religions. ATTENTION Librarians, Teachers and Retailers: Harnessing Fire is also available at reduced cost for academic institutions, lending libraries (public and private) and retailers. Check our online store, or email baeditor@gmail.com with any questions.